This article provides a brief update to The Rational Walk’s research report on Platinum Underwriters. More than two years have passed since the report was published in October 2011 which is enough time to evaluate the validity of the investment thesis. Platinum recently released results for 2013 along with a detailed financial supplement and held a conference call for analysts. We take a look back at the situation in late 2011, evaluate the latest financial results, and attempt to determine whether Platinum might represent a solid investment opportunity based on its current market price and future prospects. Market participants are often thought of as being forward looking but it is not uncommon for investors to simply discard investments that have demonstrated temporary weakness in the recent past. This was the case with Platinum in 2011. Due to the impact of major catastrophes in 2011, Platinum had posted a net loss of $231 million for the first nine months of the year and an abysmal year-to-date combined ratio of 156 percent. As a result, Platinum shares traded at approximately two-thirds of fully diluted tangible book value as market participants focused on negative headlines rather than Platinum’s strong long term record spanning nearly a decade. For full details regarding the company’s financial position at the time, please refer to the research report. The chart below shows Platinum’s stock price performance from January 2011 up to the current date (click on the image for a larger view). As we can see, the stock price fell steadily throughout 2011 before bottoming out in the fourth quarter and starting a steady rise where the stock more than doubled over two years. We take no credit for the timing of the report which happened to be released near the low for the stock. There is no way to predict what a stock will do in the short run. Instead, the investment thesis was based on the market ignoring the company’s long term fundamental strengths which became more clear to the market once better current period results started to emerge in 2012. Platinum reported net income of $223.3 million and diluted earnings per common share of $7.35 for 2013. Annual return on equity was 12.9 percent and fully diluted book value per common share was $60.64 as of December 31, 2013. Over the two year period ending on December 31, 2013, fully diluted book value per share grew at a rate of 13.7 percent. During the fourth quarter of 2013, Platinum shares traded at near book value most of the time. Shareholder returns over the two year period was in the neighborhood of 100 percent due to both the increase in book value as well as the market lifting the price-to-book ratio from a one third discount to book to parity. One can view shareholder returns of consisting of a combination of improved investor sentiment and solid financial results. A number of charts and exhibits appeared in the 2011 report which serve to quickly illustrate Platinum’s long term track record along with what we believed was temporary weakness in 2011 that was unlikely to recur repeatedly in the future. 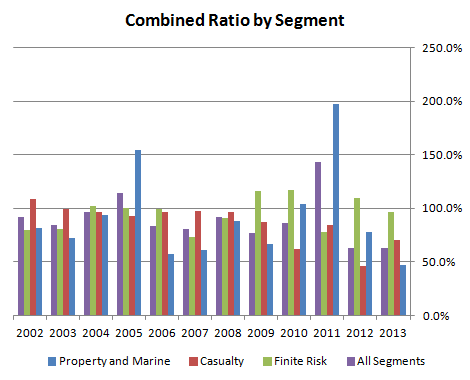 One of the most important metrics for an insurance company is the combined ratio. An insurance company that regularly posts a combined ratio above 100 percent is generating underwriting losses on a normalized basis and must rely entirely on investment income to provide a return to equity holders. In the current interest rate environment, any insurer that does not have a sustainable combined ratio well below 100 is unlikely to achieve acceptable returns for equity holders. The exhibit below shows Platinum’s combined ratio by segment from the company’s inception through the end of 2013. The purple bar for each year shows the total combined ratio for all segments. We can see that after a very poor 2011, Platinum generated very low combined ratios for 2012 and 2013. Part of the drop in the combined ratio was due to lower current period catastrophes but Platinum also posted regular “reserve releases” that bolstered results in 2012 and 2013. Reserve releases occur when management revises prior loss reserve estimates to reflect lower than expected claims based on receiving additional information from primary insurers. As the exhibit below shows, net favorable development has been a recurring feature of Platinum’s reports for most of its history. In general, insurance companies attempt to estimate reserves at a level that is sufficient for payment of both known and unknown future claims. 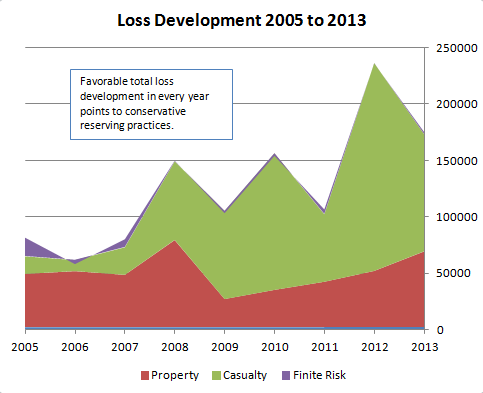 Some management teams are more conservative than others, however, and this conservatism is most evident when one examines loss development trends. There is some risk that a management team may purposely overstate reserves in good years in order to release reserves in bad years which would constitute a “cookie jar” type of policy but eventually this type of bad practice is likely to be exposed. In the case of Platinum, it appears that management’s long history of conservative practices is sound and should give investors confidence. 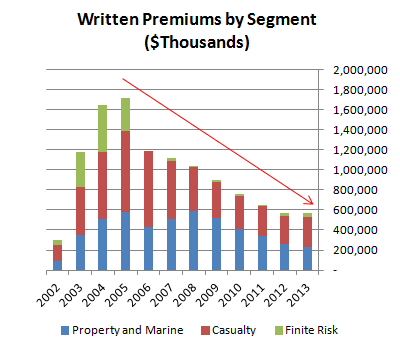 One of the charts provided in the 2011 report displayed the trend of declining written premiums since 2005. Management has been disciplined in terms of rejecting inadequately priced business and this has been evident in a steep decline in written premiums. An updated chart is displayed below which shows that this trend has continued but might now be stabilizing. While written premiums have declined, Platinum has maintained a very strong equity position with written premiums declining to 32 percent of equity from 39 percent at the end of 2011. Shareholders equity has increased over the two year span despite the fact that management has repurchased a significant number of shares at prices well below book value. The share count decreased from 35.5 million at the end of 2011 to 28.1 million at the end of 2013. Every time Platinum purchases its own shares below book value, this results in accretion to book value for continuing shareholders. Platinum nevertheless appears overcapitalized at $1.75 billion of shareholders equity given management’s statement that only $1.5 billion of equity is needed to support the business (see conference call transcript link provided above). This points to the possibility of future repurchases at prices below book value. 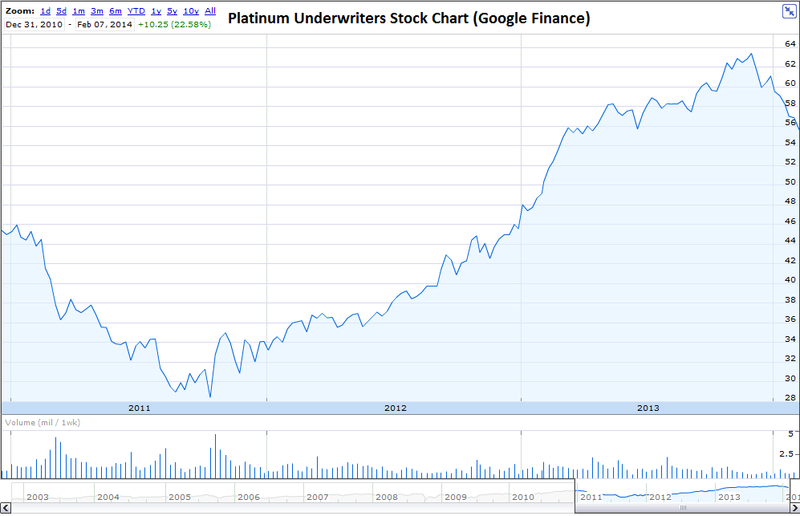 Platinum Underwriters serves as a good case study regarding opportunities that exist when short term adversity clouds the judgment of market participants and obscures a solid long term track record that is likely to continue. In Platinum’s case, sticking to the principles that led to its pre-2011 track record allowed management to grow book value per share at a very satisfactory rate in 2012 and 2013. This growth in book value was then combined with the market’s reassessment of the company’s prospects as “headline” numbers from earnings reports improved and 2011 numbers receded from memory. Value investing is not a discipline that has any chance of outperforming the overall market under all conditions and time frames. In fact, poor performance is nearly inevitable in the short run when purchasing securities that other market participants despise. However, over a two to three year investment time horizon, value investors can usually benefit from the market’s reassessment of a fundamentally sound company. Platinum is currently trading at approximately 91 percent of book value which reflects some pessimism but not the extreme disdain implied by the prevailing discount in late 2011. As a result, investor results for Platinum going forward are likely to track progress in the underlying business with the prospect of a small additional gain if shares trade closer to book value.